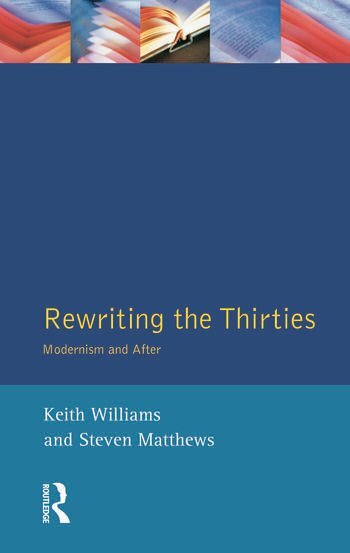 Rewriting the Thirties questions the myth of the 'anti-modernist' decade. Conversely, the editors argue it is a symptomatic, transitional phase between modern and post-modern writing and politics, at a time of cultural and technological change. The text reconsiders some of the leading writers of the period in the light of recent theoretical developments, through essays on the ambivalent assimilation of Modernist influences, among proletarian and canonical novelists including James Barke and George Orwell, and among poets including Auden, MacNeice, Swingler and Bunting, and in the work of feminist writers Vera Brittain and Winifred Holtby. In this substantial remapping, the complexity and scope of literary-critical debate at the time is discussed in relation to theatrical innovation, audience attitudes to the mass medium of modernity - cinema - the poetics of suburbia, consumerism and national ideology, as well as the discursive strategies of British and American documentarism. Keith Williams is Senior Lecturer in English at the University of Dundee, UK. Steven Matthews is Professor of English Literature at the University of Reading, UK.